The good life: It helps that India’s new rich are not shy to spend their wealth. Seen the new beauties in town? Nope, I’m not talking about the Rs3 crore plus Rolls-Royce Phantom Drophead Coupé which is currently parked at Mumbai’s Atria Mall. The silver convertible with a brushed steel bonnet and blue hood will be on display until its new owner completes the registration process. I’m referring to the stunners that landed in the Mumbai harbour recently. As I write this, I’ve just been invited to go aboard the super luxury Italian-made Ferretti 550 that arrived in the Mumbai harbour, along with a Ferretti 460. The 550 is not one of those boats from the Gulf (the Mumbai harbour is full of them) that cost slightly over Rs40 lakh and that are used mainly to whisk their owners across the bay to their weekend homes in Alibaug. 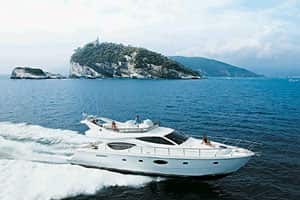 The 55-footer boat has two guest cabins, a master cabin, salon, galley, crew cabin—and a price tag of around Rs14 crore. Luxury cars have been done to death. Now, every seriously rich person needs a luxury yacht. It helps that India’s new rich are not shy to spend their wealth. The Wadhwans of Housing Development and Infrastructure Ltd, who recently featured in the Hindustan Times’ series New Wealth Creators, reportedly just bought their second Rolls. Business Standard’s annual Billionaire Club survey found that there are now 48 Indians worth more than $1billion (approx. Rs4,000 crore). The newspaper said that the number of senior executives who earn more than Rs1 crore increased to 576 from 442 in 2005-06. So, it’s not surprising that business is booming for Anju and Gautam Dutta, who run Marine Solutions, the exclusive representatives of Ferretti Yachts in India. Anju’s hoping to sell a 100 footer next. The boats for Club Privada’s yacht timeshare were sourced from Atul Bhonsle, who represents companies such as Azimut, Larson, Cobalt Boats, Sumerset and Grady-White. Bhonsle believes that in India, people don’t just buy boats to show-off, it’s a genuine lifestyle need. Gautam Datta agrees. “Unlike China, there has been a history of sailing in India. Here, there’s an actual liking for water, in places like China and Korea they don’t have any proper yacht clubs." Many Indian boat clubs are more than 100 years old. And for those of you who can’t afford a yacht, it’s fairly simple to organize your own sunset cruise. Just pack a basket of food and drink and hire one of those old-style wooden boats you see at the Gateway of India.